Over the years we have had many requests for an up-to-date “How to Build an EcoNest” book. Since Robert first wrote the original Mooseprints: A Holistic Home Building Guide in 1992, our processes have evolved. More than 1,500 students have participated in an EcoNest Natural Building Workshop over the past 25 years, and each has made a contribution—left us “a $50 tip”—that has improved or streamlined the process of crafting a successful nest. Wall framing and stuffing, which once took three weeks is now accomplished with a workshop of 12 in just four days. In Section II we will give you clear step-by-step, easy to follow instructions for building a successful Light Straw Clay (LSC) structure. We have a secret hope however, that the content of this book will entice you to experience one of our workshops in person because a workshop is an opportunity for you to bask in the camaraderie, dedication, and craftsmanship that magically develop in the good company of like-minded earth stewards with a passion for building a better future. This is also a “Why to Build an EcoNest” book. The era of green building is burgeoning. With cutting-edge technologies, ever-more efficient mechanicals, high-performance synthetic wall systems, super-insulating foams, stickier tapes and tighter vapor barriers, why on earth would we choose to build with earth…and straw, timbers and stone? Why cling to a building system that uses natural, unadulterated materials when state-of-the-art lab-tested synthetic building products are so readily available and convenient? Our answer lies in the fact that we have repeatedly witnessed something so profound that it has shaped and inspired us to embrace nature in our homes and dedicate our work to helping others do the same. For the past 25 years, we have opened our door to countless strangers: building professionals, aspiring builders, eco-home seekers, soon-to-be homeowners, the chemically sensitive, and the curious. We have seen the transformation that occurs over and over again as these people discover, for the first time in their lives, just how good, how strangely familiar and right, a natural home feels. We have also experienced the ongoing enrichment that our nest has provided for us in our own quest to be the best that we can be. 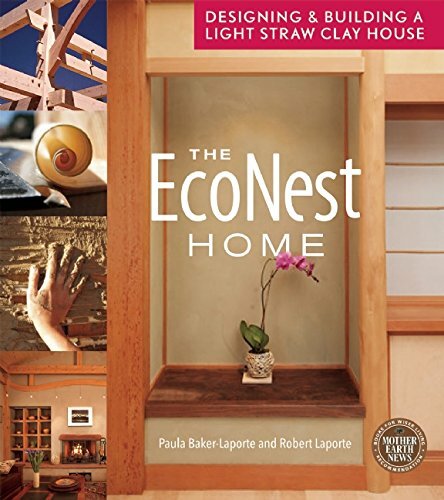 Unlike Europeans or Asians, who grow up in historic settings steeped in time-honored building traditions that are often crafted from nature, most North Americans have never had the opportunity to experience the timeless and nurturing quality of the natural home. All but forgotten, or never really understood, is the fact that we are a part of nature—the ultimate model of sustainability and ecological regeneration. When we build with nature’s unadulterated materials and a deep understanding of her laws, we can build a home that nurtures us and respects her. We call this the biological home. Our mission is to make this kind of home a familiar and mainstream North American alternative to conventional mechanically dependent and petro chemically-based construction.